Meeting Of Styles returned to Shoreditch recently for the second Summer on the trot. Over a 2 day period spraycan graffiti writers and street artists from Brazil to Russia via Spain and UK threw a wild ribbon of colour around Shoreditch. Tyme (Swe), Adno (Rus), Awone (Swe), DJa’Louz (Fr) and from the UK Jim Vision, Zadok and below them Kak, Ekto and Wisher. Meeting of Styles is an international and not-for-profit federation of spraycan festivals, this year 22 MoS festivals around the world are responding to the “Mind Above Matter” theme, though not all were as focussed on the theme as Neoh below. The focal point for the festival was a dramatically transformed elbow of land trapped between a knot of railway tracks now under new ownership and currently renamed the Nomadic Community Gardens. A primarily Bangladeshi community have transformed the Fleet St Hill end of the gardens with raised beds of allotments while a temporary village of tents, vans and dens of upcycled wood and canvas housed kitchens, bars, decks and admin. Wall locations were geographically more wide spread this year, the centre of weight shifted over to the Bethnal Green side of Brick Lane with some painting taking place even further east than the Nomadic Gardens Community Centre. Traditional bubble letters and wild style sit happily alongside 3D, abstract, the “post graffiti graffuturism” and calligraphy based graffiti writing. It is not all letter writing though, characters and creatures and even sculpture made an appearance. For a lot more photographs and a bit more analysis, check out the Graffoto post of which this is essentially an abstract of highlights. 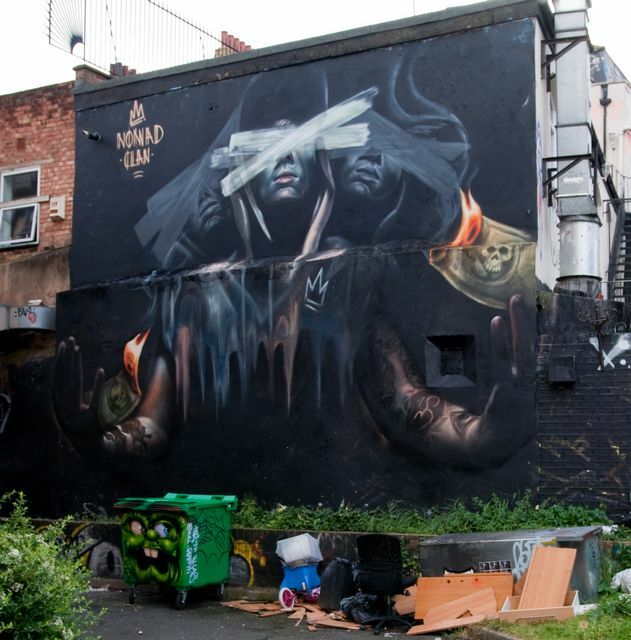 This entry was posted in News and tagged Art, Artist, Graffiti, London, meeting of styles, Nomadic Community Gardens, Shoreditch, Street Art, Tour, Tours on 07/24/2015 by Shoreditch Street Art Tours. A wall which was virgin brick as we passed at 11am yesterday this morning sported a gorgeous new piece of street art. Neoh is an unusual character with roots firmly planted in the coarser end of graffiti, the emphasis is more on being “up” than on elaborate style. However, when Neoh puts his arty hat on, brilliant impressionist characters emerge including this energetic ballerina conjured into existence last night. The repetition of the cubist tinged faces has resulted in the motion of the ballerina being captured in her head as her whole body pirhouettes. we get simultaneous front and rear views. This is a girl fully committed to the sinuous motion of the ballet. We are willing to speculate that no mural permission broker was involved in this new one! We have been unstinting admirers not only of Neoh’s graff but the awesome movement and economy in his impressionist dancers. It is such a delight to unexpectedly find new pieces of art on the street and Neoh’s speed, attitude and single-minded determination to get up in a variety of different media is really what graffiti AND street art is all about. 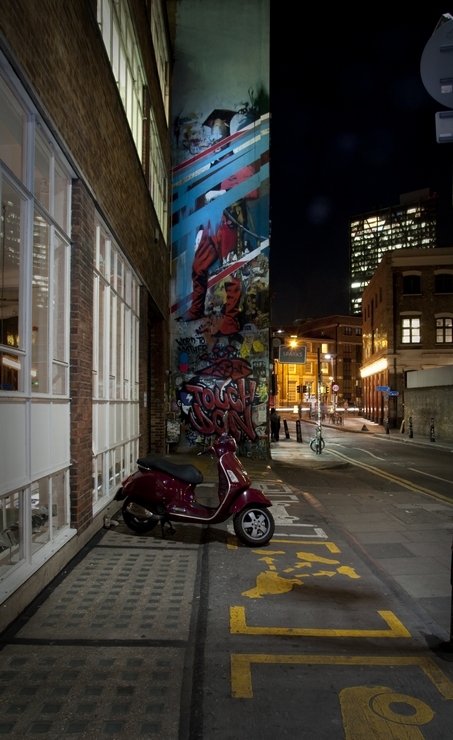 This entry was posted in News and tagged cubism., freehand, Graffiti, impressionism, London, Neoh, Shoreditch, spraypaint, Street Art, tagging on 05/18/2015 by Shoreditch Street Art Tours.